You probably know by now that Windows 8 Consumer Preview was released recently. This is what Microsoft is betting their future on, combining their traditional desktop experience with the all new tiled Metro interface, aimed at tablets and portable computers. 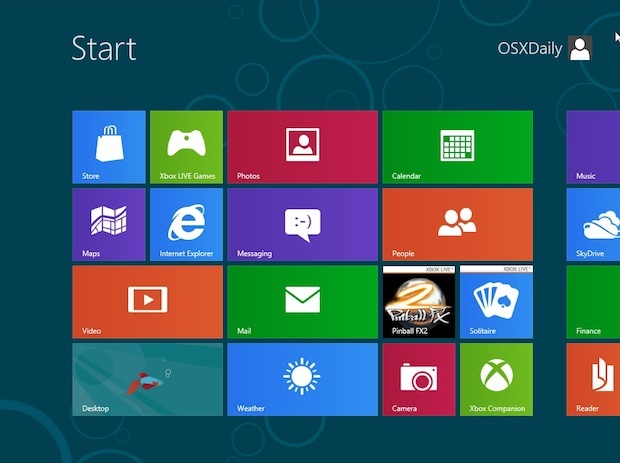 Thanks to virtualization, anyone can try Windows 8 easily right on top of their current operating system. This makes it easy to both install and also remove later when you’re done with it. 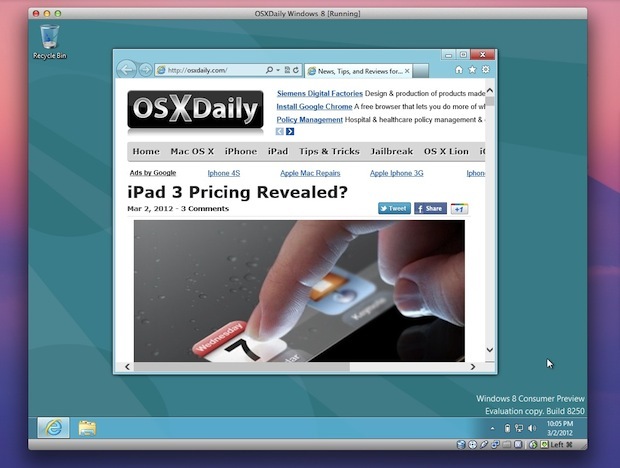 While this article is intended for Mac users, VirtualBox will run in Linux, Solaris, and Windows as well, so you can take this to just about any platform. Be sure to match the version of VirtualBox to the version of Windows 8 Consumer Preview that you download, if you get one in 64-bit, get both in 64-bit, same goes with 32-bit versions. For the best performance, you’ll want to use a reasonably new computer with at least 4GB of RAM. As usual, VM’s are much faster running off of an SSD, but it isn’t a requirement. Really the best part about Windows 8 is the Metro interface. The redesigned user interface is obviously suited for tablets and touch surfaces, but it works with a mouse and trackpad too to get a feel for things. Put VirtualBox into full-screen mode for the best experience here, and remember this is a Consumer Preview (public beta) and it’s currently lacking multitouch support so not everything will be identical to the final version. If you want access to the Windows 8 App Store, you’ll need a Microsoft login through hotmail, MSN, or just create one when necessary. You’ll find a handful of free apps available to play around with, including some popular games. You’ll notice that even in the traditional desktop mode there are some major changes, most notably there is no Start menu, making this the first major UX change for Windows since Windows 95 really. All in all it’s an interesting operating system to check out, but I’ll be staying with a Mac. If you saw us cover this before, you’ll find the latest version of VirtualBox makes installing Windows 8 Consumer Preview much easier than the original Developer Preview, and there is practically no configuration required to get everything working. Nice! Between installing VirtualBox and Windows 8 how much of a footprint does it take? VirtualBox is about 250MB installed, Windows 8 takes up about 6GB out of the 20GB dynamically allocated to it. With the latter you could get away with a smaller virtual drive, but Windows recommends 16GB for some reason. Windows seems like a pig for space. Nothing has changed I see since I last ran XP back in 06. Performance is pretty decent on a 2011 MacBook Air 13″, not bad but it would be better with multitouch! Any way to make it run with my native resolution on my Macbook Air 13′ at 1440 x 900? I don’t see an option to change the resolution in VirtualBox. On a 2009 MBP with 2GB of RAM, it keeps giving a kernel panic when trying to boot the VM. Any suggestions? How many Megabytes would that be? I set it to 1024MB and it still gave me a kernel panic. Appears not to run at all within Parallels 7 (version 7.0.15054.722853) on my MacBook Pro. Just sits there and doesn’t respond to any interaction whatsoever… hmmm. Windows 7 runs very well. They did look like getting somewhere with 7, but…! Maybe on a tablet they will make sense but on the desktop? Hope the final product is better (in my dreams)! Agree, on a desktop it’s a mess. Tablet is where this OS could be good. Otherwise Apple has the future. Installed it, looked at it, deleted it! Have’nt got around to installing anything yet but from the few comments that I have read so far it does’nt sound like anything that one would install on a Mac. Hi, can someone tell me how to come back to the initial screen? I click on desktop, but then i don’t know how to get back to the “new” screen and features (it’s not the usual windows button at the bottom left). Forget it, I notice that it works with the command button (right). Put your cursor in the lower left corner and click when the little ‘Start’ box appears . Is this a joke? After initial install per these instructions, Win8 will not boot without ‘Repair’ or ‘Refresh’ under VBox on my iMac ( both 64-bit as suggested in article ). If it finally boots, all I get is a nice screensaver background with a clock and an icon that apparently suggests that there is internet connectivity. Mouse clicks cause nothing but the background pic to jump about 20 pixels and return. I have to hit the ENTER key to get a login prompt. This is intuitive and user-friendly? What a was of diskspace and time. It’s not Windows 8 that’s a joke, it’s the people who love to act like the installed it, thought it sucked then deleted it. You’re computer savvy enough to see the vids, read the articles; why even install it? Windows 8 tablet mode will easily rival the iPad. I love Apple, I own just about every product they sell, but I enjoy an ecosystem of Windows, Mac and Linux. Sorry, but Apple isn’t perfect and until they can learn how to roll out major updates between older and newer devices more seamlessly and reliably, Apple is just as human as Microsoft and Google. Did anyone manage to change the resolution of Windows 8 to fit my iMac 27″ (2560 x 1440) so it is true fullscreen? I’m stuck at 1600×1200. I understand that guest additions aren’t working so there is no way to do this from the VirtulBox manager. I saw some tricks coming by using the mac terminal but somehow I can’t get this to work. If anyone managed to get Windows 8 running full screen in VirtualBox I will be pleased to hear it. I only see one possible download version at that link – it doesn’t mention 32 or 64 bit anywhere. I d/l’d it (Mac OSX), followed the instructions, and I get an error when starting the Win8 VM saying “This 64-bit application couldn’t load because your PC doesn’t have a 64-bit processor”. False – it’s an Intel Core i5. It runs Win7 Ultimate 64-bit in VMWare no problem. (I also tried VMWare to get Win8 going – I get some kind of HAL error at startup). You need do download the 64 bit version of VirtualBox if you plan on using the 64 bit version of Windows 8, go with the 32bit version if you are having problems. I booted it up once, but now when it boots it says attempting repairs. I had this problem too until I figured it out; I changed the boot order so that Hard Disk option is at top (before Floppy, CD/DVD). Now the VirtualBox PC starts up fine every time! Didn’t mind Windows 7 at work but this just isn’t doing it for me…tiles?…oh brother. Will stick with Snow Leopard and wait for Mountain Lion. Heck, I’d rather use Linux Mint Debian Edition than Windows 8 from what I’ve seen running it in VirtualBox. Oh well, better luck next time Microsoft. Ok, so I’m a complete idiot but any help would be appreciated. I installed parallel for mac and windows 8 preview (ugh, I was lost for words at how ridiculous it is) and now want to delete both … HOW? Windows 8 seems to be hidden somewhere! 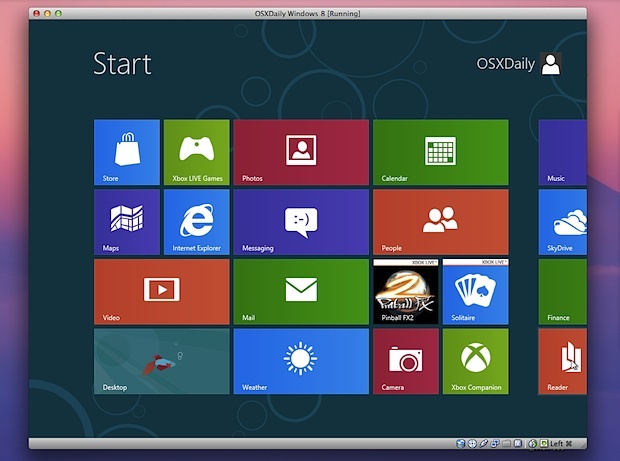 First you open up parallels and delete the Windows 8 virtual machine that you created. Now, you should be able to simply go into Applications and move “Parallels” to the trash. Im using the Macbook Pro 13.3 inch with a 2.8ghz cpu and 750gb harddrive (Just so you know…) and I’ve done all this and Im in the OS but I cannot connect to the internet. Does it have to be connected via cable or can it be wireless? But what settings works for everyone else? Because I’ve tried all of the options but there are so many more options in the advanced tab on each option so I don’t know what to use. But now if there is any confusion, can you use a wireless internet connection to use internet on windows 8 and what settings should you use to make it work? If it doesn’t work over wireless, what settings should you use when you have the cable plugged in the computer?